Download Deluce font for free. Deluce is a font / typeface offered for free. please note that if the license offered here is non-commercial you have to obtain a commercial use license / permit from the original author. 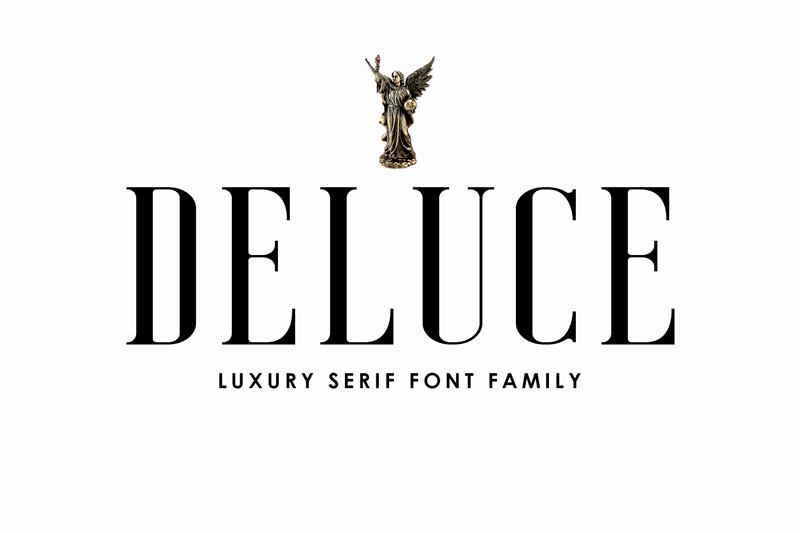 Deluce – Luxury Serif Font is a modern serif font family whose design refers us to the style of transitional serifs. The distinctive features of Deluce – Luxury Serif Font are the relatively low contrast of strokes, the slightly squarish shapes of round characters and the emphasized businesslike nature. Deluce – Luxury Serif Font features an original stylistic set which, when turned on, adds features of typical pointed-pen serifs to some of the lowercase characters. In addition, Deluce – Luxury Serif Font has small capitals for Latin and Cyrillic alphabets, as well as several interesting ligatures. Deluce – Luxury Serif Font also suitable for art, modern envelope lettering or book design, happening style like handdrawn design or watercolor design theme, craft design, any DIY project, book title, wedding font, pop vintage design, or any purpose to make our art/design project look pretty and trendy. If the Deluce font is offered under 'commercial use free' or 'creative common' license, feel free to use Deluce font for any purpose.